Cancer therapy has made amazing strides in the last few years. Cases that were considered untreatable in the past are well within the reach of modern therapies. You see evidence of this fact all the time, not only in statistics but in news stories as well. One thing hasn’t changed, however. Early detection is still crucial. That’s why dentists include oral cancer screenings as part of every routine checkup. It takes a keen professional to spot warning signs that others overlook. Seeing your dentist every six months allows him or her to examine only your teeth and gums but your lips, mouth tissues, head, and neck as well. That way, if cancer does appear, then medical treatment can begin promptly. Persistent sore throat with no apparent cause. Increased phlegm in your throat. A sore in your mouth or on your lips that never heals. Unexplained pain in your mouth or ears. A lump inside your mouth or on your lips. Loose teeth unrelated to cavities or gum disease. See a dentist or other medical professional right away if you notice any of these symptoms. Toothache prevention. Like other illnesses, tooth decay is easiest to treat when it’s caught in its early stages. Not only can this prevent needless discomfort, it can save a tooth that might otherwise be lost. Updated information. Dental coverage plans are always changing. 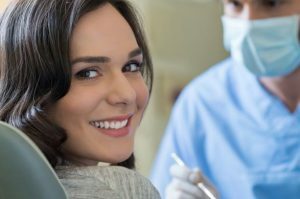 Seeing your dentist every few months allows the office manager to keep your records current, ensuring you’ll be able to receive treatment when you need it the most. Important information and tips. Dentists are continuously upgrading their knowledge and skills. Much of what they learn can help you to take better care of your own teeth and gums. But this can never happen unless you keep your appointments. Setting a positive example. Seeing you take care of your teeth and gums will encourage friends and family members to do the same. A chance to feel good about yourself. Knowing that you’ve done something positive for yourself not only crosses an item off your list, it can help you to focus on other important matters. Maybe you’re one of the many people who hasn’t seen a dentist in a while. If that’s the case, why not make an appointment today? You have nothing to lose and a world of benefits to gain. We wish you lots of happy smiles, throughout 2019 and beyond. Dr. Renee Corbitt has been practicing dentistry in Texas for more than 30 years. A graduate of the University of Texas Health Science Center San Antonio Dental School, she keeps her skills sharp through continuous training and ongoing education. You can reach her office online or by calling (817) 294-8821.